With dipping sauce. 3 mins serves 2. Volleyball England Beach Tour - Official partner. Source of protein. No MSG. For 8 gyoza.Dipping sauce is ready to serve ^no preparation required].For guidance only, cooking appliances will vary.Please ensure food is cooked until piping hot.Do not re-heat once cooked. Do not heat sauce sachet. Gently simmer.Submerge gyoza in a saucepan of softly boiling water.Simmer gently for 3 minutes.Drain thoroughly & serve. Pre-heat pan with 2 teaspoons of oil on low/medium heat.Cook gyoza for 6 minutes, turning regularly until golden brown. 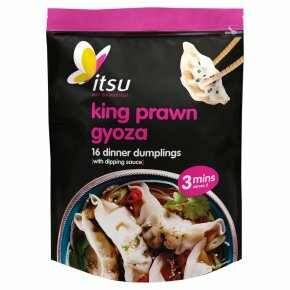 Place gyoza on a microwavable plate.Microwave for 2 minutes on high power (800W).Leave to stand for 1 minute before serving.